Please visit Riverside County Transportation Efficiency Corridor for more information about this project. RCTC is preparing to build the 15/91 Express Lanes Connector, which will link the 91 Express Lanes to the future I-15 Express Lanes, which began construction in 2018. This project is separate from the I-15 Express Lanes Project. 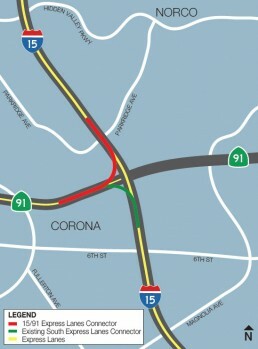 The connector will link the eastbound 91 Express Lanes to the northbound I-15 Express Lanes, and link the southbound I-15 Express Lanes to the westbound 91 Express Lanes. Funded by Senate Bill 132, the 15/91 Express Lanes Connector is anticipated to be complete in 2022 and is designed to provide a seamless transition between these Riverside County tolling systems for reliable, congestion-free travel for vehicles and express buses.